Sometimes, an interview completely takes on a life of its own, and it becomes difficult to submit to the reader in a standard “question-and-answer” format, or even as a standalone narrative piece. Such is the case with ex-Salt Lake City resident Jhon Longshaw and his excellent black noise vehicle, Black Seas of Infinity. Longshaw is an intriguing individual, someone who harkens back to a time long past, but who still has both feet planted in the present, and I am personally a bit perturbed that I wasn’t offered a chance to speak with him longer before his relocation to Seattle, Wash. Some of us in Salt Lake City were privileged enough to witness a Black Seas of Infinity’s live ritual when they presented it alongside Watain in October of 2008. For those that have never been present at one of these harrowing escapades, Longshaw explains it as follows: “A Black Seas of Infinity live ritual is the vehicle of the oracles, eternally flowing cascades of Saturnian magnification. It is the channeling of the force of nothing incarnate, inseminating the minds of men with the seed of incalculable aeons. Perpetuating eruptions of the highest gnosis upon all who experience these instruments of desire, will and manifestation … I invoke the mysteries of the 11-fold secret. Through my heart and my tongue are absorbed and consumed the eternal becoming.” If this sounds confusing to you, you should be ashamed of yourself for never having experienced the live entity that is Black Seas of Infinity. 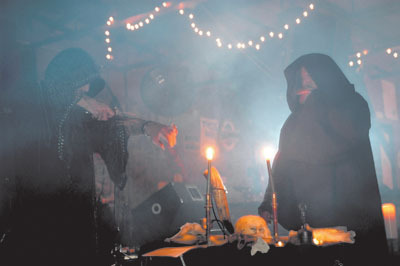 Both recording and performing live rituals are equally important to Longshaw. “The live performance encompasses the true nature of the ideologies present. To experience the live performance is to truly become one with the haunting, spectral initiations enacted upon those in attendance,” he says. However, the ideas expressed live are present within the recorded material as well. “The true importance being that of manifestation in the form of released material or of live gatherings is the perpetuation and revealing of the mysteries that we channel through our personal magickal workings, which,” Longshaw says, “primarily, at the present time, lie within the sorceries of the crooked path.” As stated previously, I have been attempting to gather all seven available Black Seas of Infinity releases, and his explanation makes perfect sense to me, as improbable as it may sound to the casual reader. From the haunting blackness of Amrita to the almost off-putting live performance of Invokation, listening to the recorded output of Black Seas of Infinity in the discomfort of one’s home is an experience in and of itself, almost to the point of becoming claustrophobic. “I listen to and enjoy a wide and diverse collection of music, but the influences that contribute to what I create within Black Seas of Infinity are not musical,” says Longshaw. While expressing interest in such artists as Techno Animal, Unearthly Trance, Virus, Scorn, Circle of Ouroborus and Abelcain, Longshaw is quick to point out that Black Seas of Infinity is a influenced and motivated by something altogether different. “I channel the arcanum of mysteries that can not be known or expressed within the human faculty of speech.” Longshaw admittedly composes all of the music for Black Seas of Infinity, although there is one other current member and several past members, considering that Black Seas of Infinity was initially formed as a black metal project back in 1990s. “That shall change on future releases,” Longshaw says, in reference to his being the sole composer of Black Seas’ material, “as Catamara Rosarium will also be composing material as well as permeating the material with the essence of our received transmissions.” With Longshaw’s move to Seattle, both of the current members now reside in the same area. According to Longshaw, Rosarium has an extensive background in the arte magickal from many different perspectives and paradigms, as well as having been involved in the electronic musical schema for many years as a DJ amongst other endeavours.” Catamara’s first appearance is displayed on Black Seas’ most current release, Hieros Gamos, and Longshaw explains her as “the oracle of the fire serpent, radiating averse permutations of haunting thunders, amidst the unawakened houses of wisdom and understanding.” Past live member Cody Dickerson, an ex-Utahn in his own right, has departed the project for the time being. 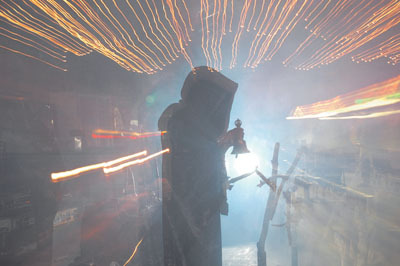 This is due to time restraints within other areas of his life, according to Longshaw, although his presence in Black Seas’ live rituals has not gone unappreciated. “His contributions were more scalding than the lamentation of a thousand bleeding moons,” says Longshaw. “We are enshrouded in the mysteries of the great night of time,” Longshaw says when I express to him my inability to find much, if any, print coverage of, or interviews with, Black Seas of Infinity. “Words only serve to distort the beckoning essence of our tendrils of ekstasis. If one searches for information in the form of interviews, reviews and the written word that explores the center and extension of our outpourings they shall become as the occultem lapidem.” This automatically takes me by surprise, as this interview came about over a conversation between Longshaw and myself at the Watain show. Having known of him, but also having not actually met him, for quite some time, he seemed to me at the time of our meeting to be an extremely driven individual, and someone who might actually feel “right at home” granting interviews and sharing the secrets behind Black Seas of Infinity. His apparent denouncement of interviews at first makes me feel privileged, if not downright flattered. His later statement that there will be more press coverage in the near future “as it is time to unveil the secrets of midnight’s eden,” does nothing to shake my initial feeling. On the contrary, it actually makes me feel as though I am being given a chance to present Black Seas of Infinity to those that may be unaware of their presence for one of the first times in a published forum. As I have seemingly run out of questions for Longshaw, I allow him to complete this piece in his own words. Serpent fingers excite the seven and 10 spheres, mutable gestures unfold the one, as flames of retreat, and desire feed demonolatria divine. Half visible, shifts of consciousness rescind absorption of the brilliance. The double wand is thine eye, for therein the petals of consummation blanket vessels of secretions and devourment. My priestess is the gateway, aeons of incalculable articulation lap at the shores induction, excremental nourishment seethes with the powers of N.O.X. Concealeth the night with my tongue, for voices of the hidden gods we are as doorways into naught exude the ingression of the blood, and the unveiling of secret objurations. As the gleam of blackness sunders the glistening waters, elder angles manifest the sublime. Ascend to the crown of wisdom to reveal the descent. Awaken chaos as intertwined streams transcend the shimmering presence, transformed with woe by the apperceivement of the ophidian flames, as it were the choir of angels drowning. Secrets of the obedient thunders under the dragon of mystery whisper the nameless putrescence of my exalted throne. Sonic Tyranny Productions/Ravenheart Productions (2008)* The unsettling, dissonant, heretical invocations of A.E.P have been intertwined with the seething otherworldy secretions of Black Seas of Infinity to create a basilisk of malignancy, to shoot forth its venomous rays unto the souls of the unwary, awakening the otherness of wisdom and becoming. Includes a collaboration between the two entitled ‘Betwixt the Words of the Dark Grammar Lies the Gate to the Secret Horizon.’ The consummation of the elixir of death will begin the transmutation. This was also released on cassette, which contains a different track listing through Ravenheart Productions. *Contact either Black Seas of Infinity at vinumsabbati@gmail.com or Autumn Winds Productions at autumnwp.com to order. Kaniba is the voice from the world of spirits, channeled through to a form perceivable to man; the vessel of the spirit-bear bringing the tidings of Videovora Kaniba unto this world. Kaniba is a message of freedom, spiritual growth and an urge to seek for The Source, which is all and nothing, one and many, an encouragement for everyone to find their own Truth. Kaniba is a metamorphosing entity, choosing whatever form and appearance that suits Her tidings, unchained and uncaring of the chains and trappings of the world of men. Ugegi Aoiveae A Ser strives to reach beyond the limitations of the flesh. It is a vision of pure mind transcending boundaries that in life can not be attained. This is the audial essence of transcendental gnosis showing a bleak vision of life and that which should be strived for. This vision is cold because emotion blinds the mind. It is dark as there is no light to guide you on paths you must walk alone. Black Seas of Infinity initiated its inception in 1993 executing raw black metal; it has now morphed into pure black noise revolving around and invoking such concepts as the gnosis of the black flame, qlippothic pathways, the current of set-typhon, and luciferian witchcraft. Even under the guise of black metal, it was dedicated to the unearthing of arcane and occult wisdom. Due to many line-up problems, and a lack of adequate individuals, only one demo tape was created and unleashed - “Adoration of the Black Moon” - which enveloped and glorified the ideas of the averse sephirotic tree, and a peculiar mode of congress to obtain access to qlippothic emanations.